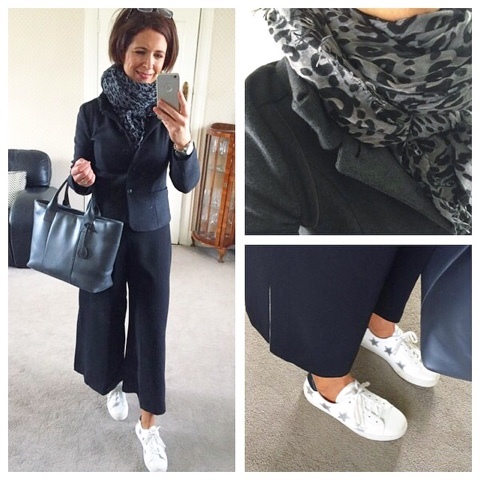 I'm all over culottes (and trainers) at the moment. You knew already about the late adaptor thing, didn't you? I need to see something worn LOTS before I feel happy to give it a try and more often than not, I want the item to be in the sale before I'll willingly part with the cash. Just in case. I'm notorious for returning stuff. 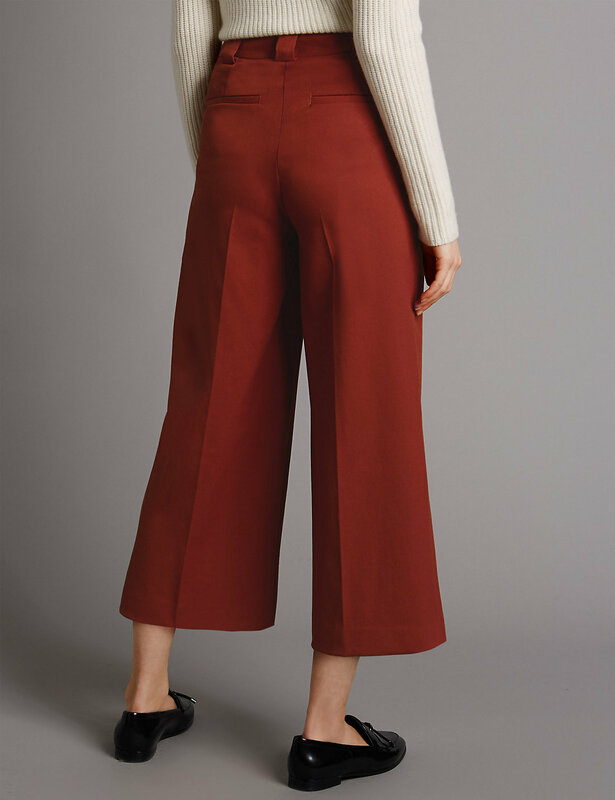 Anyway, I tried on some culottes last season with Katherin, the personal stylist at Victoria Square and it got me thinking about how much I liked the shape...they suit my long torso and help even up my proportions. At the time, I bought a culotte leg jumpsuit from Warehouse which is so flattering on. 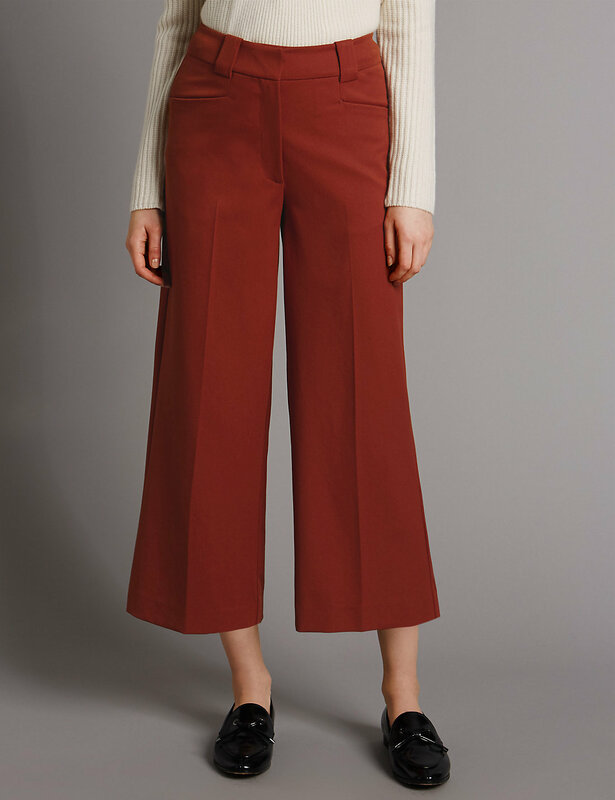 But as it's a jumpsuit, it's not practical for daytime wear so I was keeping an eye out for a suitable pair of culottes that I could wear with casual tops and as workwear too. 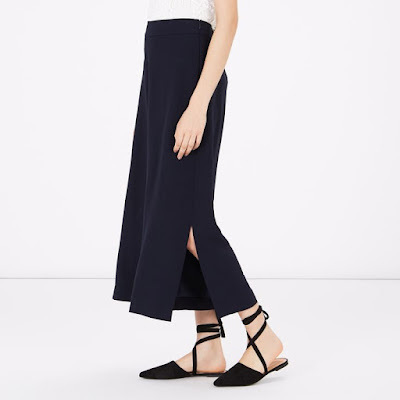 Warehouse came up trumps again with this pair of black split seam crepe culottes on the sale rail, reduced from £45 to £20. Unfortunately, they're not showing online so I can't share a nice picture. 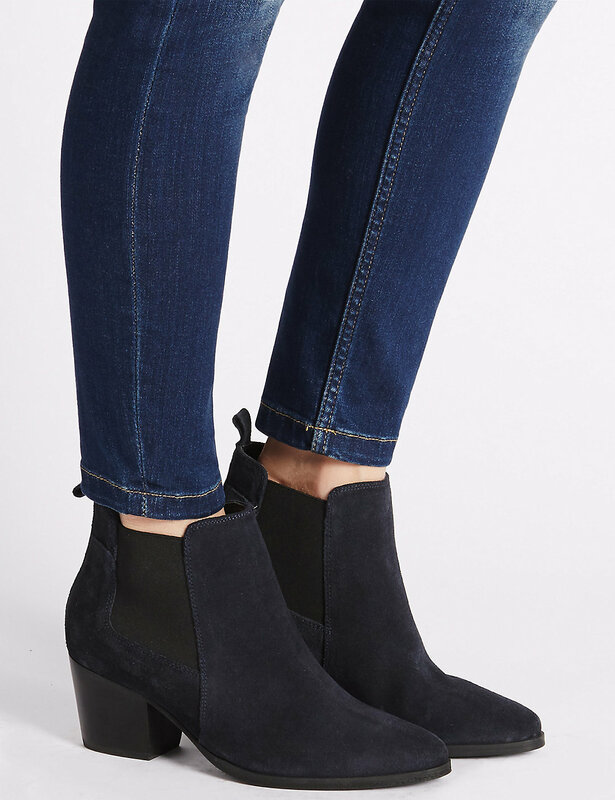 Instead, here they are in navy...which I didn't see instore but which I would buy in a heartbeat if I did!! 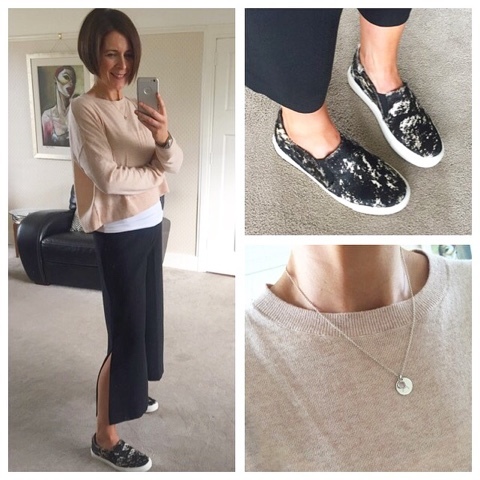 I've been asked a few questions about the fit of them on Instagram - I'm wearing a size 10 and it's spot on. They have a side zip opening so are flat fronted - lovely and flattering. They're 100% polyester, flowing crepe material and can be machine washed at 40 degrees. Bonus with these is that they work casually but I think they will look AMAZING with stilettos for a night out too. Will try that look soon. I bought the size 8 in these as there wasn't a 10 and actually they fit me. A little snug but I think the 10 will be too big. 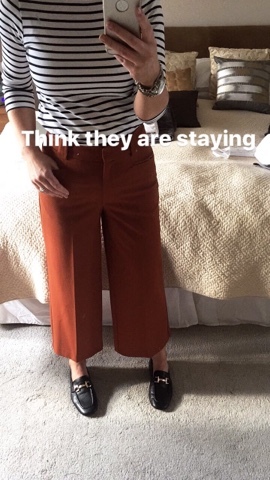 This is a screenshot of my insta story of me trying them on - hence the text. 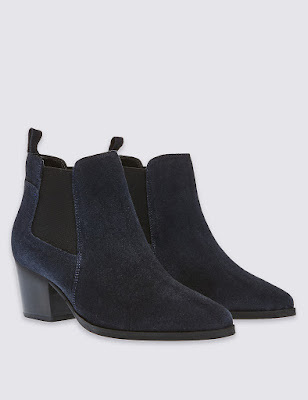 Incidentally, while I was in M&S, I tried on the following shoes and loved them. I just couldn't bring myself to buy more footwear. 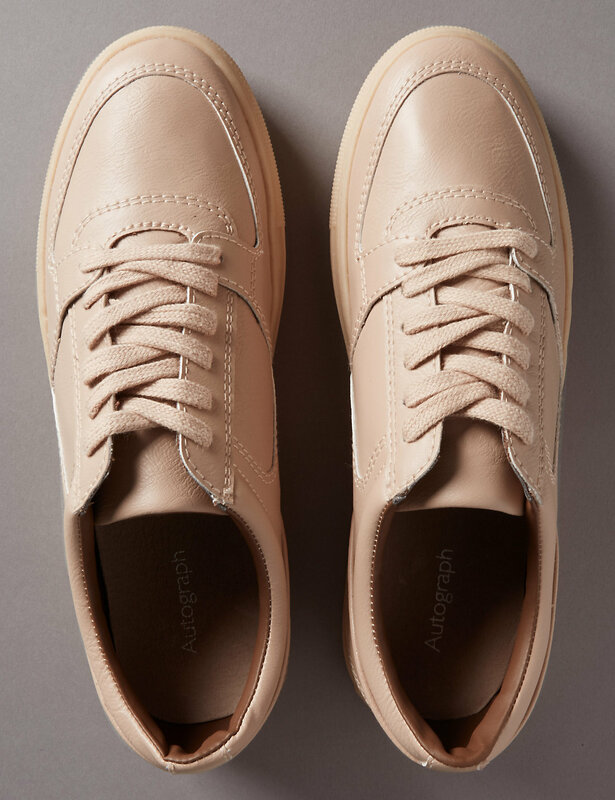 I'm literally taking the proverbial when it comes to shoes at the moment. 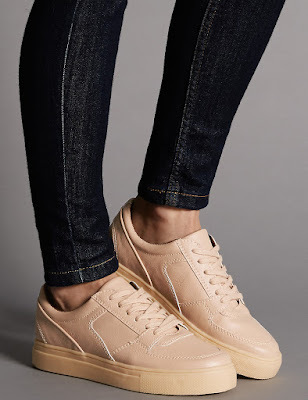 But yet, I can't stop thinking about them...could they be the perfect neutral trainer for the spring/summer? But I did take advantage of the half price offers by stocking up on school shoes for later in the term, anticipating one of the twins needing new shoes in about May....which is the worst time of the year to have to shell out for new school shoes. And I bought school tights for next winter. Check me, Mrs.
Finishing with this coat which is new stock from Autograph but it caught my eye and I can't stop thinking about it. 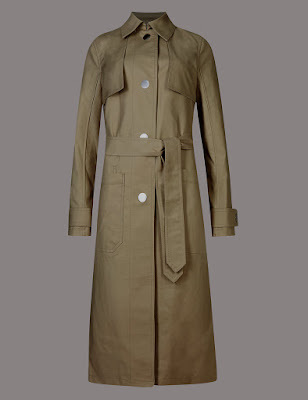 It's a khaki green trench coat. So beautifully made and looks much more expensive than it is. Sadly, by my standards, it is still kind of expensive. But I shall stalk it until the next 20% off coupon comes along and then maybe, just maybe? The Dress of Dreams....in the sale! 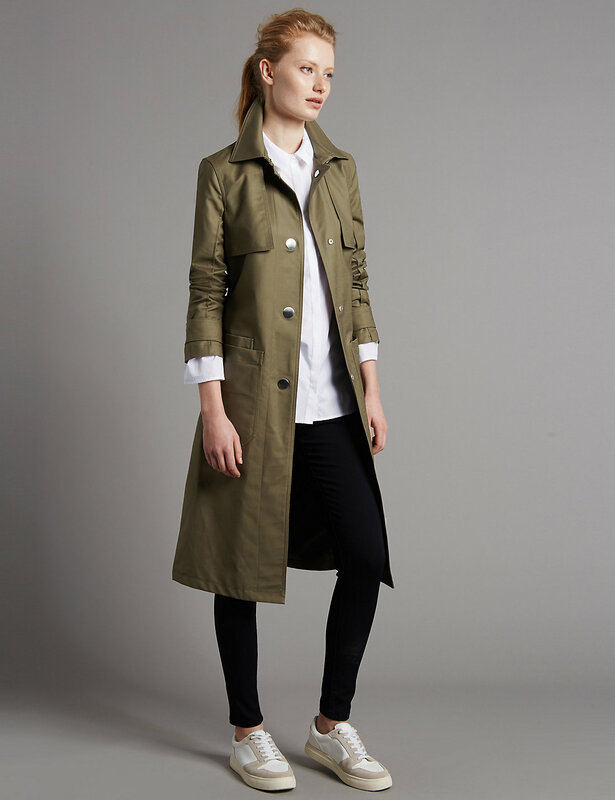 Seven Boot Lane | SS17 Review & Discount Code!